Chinatown meets China White in Paul Thomas Anderson’s druggy detective mystery – a stonoir, if you will. 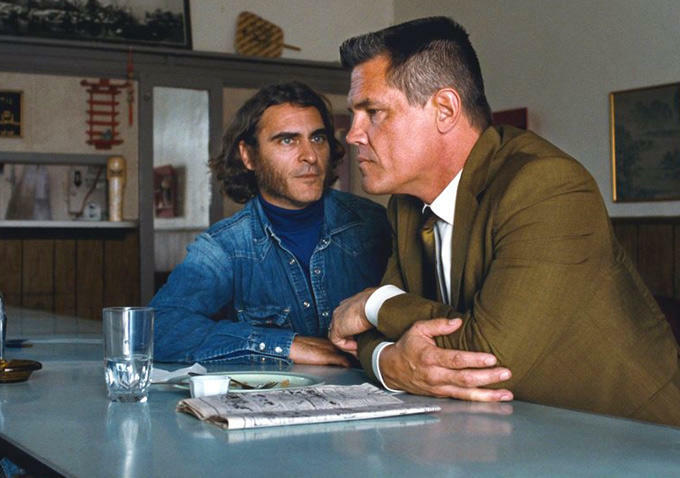 Inherent Vice is set in 1970s Los Angeles, with the Vietnam War, the Manson Family murders and cultural upheaval going on in the background. What’s going on in the foreground is anyone’s guess. Joaquin Phoenix plays a stoner detective named Doc, who’s more Shaggy Rogers than Sherlock Holmes. When his ex-girlfriend Shasta (Katherine Waterston) shows up asking for his help, he stumbles hazily into a bizarre conspiracy. Ambling in at two and a half hours, Inherent Vice is deliberately rambling and wilfully confusing. It’s too weird for the sober, but too complex for stoners. Trying to understand what’s going on is a fool’s errand – you’re better off just letting its hazy atmosphere fill your lungs. Anderson woozily captures the druggy vibe, like a live action version of A Scanner Darkly. The lighting, design and photography are tipsily beautiful, with a moodily narcotic score by Radiohead’s Jonny Greenwood. At its esoteric best, Inherent Vice is funny, trippy and almost profound in its aimlessness. There are wonderful performances from Jena Malone, Katherine Waterston and Josh Brolin as a no-nonsense cop called Bigfoot, whose head is a perfect square. But best of all is Joaquin Phoenix as furry-faced hippy Doc, who mumbles his way through surreal sleuthing scenarios like Jonathan Creek on acid. His constantly baffled facial expressions are second only to his insane mutton chops, which make Wolverine look like a little cub. Based on the novel by Thomas Pynchon, Inherent Vice succeeds as a strange slice of psychedelia. But as a narrative, it’s long, indulgent and incoherent – and purposefully so. Watching Inherent Vice is intoxicating and infuriating in equal measure, like reading the sleeve notes of a Dr. John record or living with Keith Richards. A very crazy movie, but one that hardly ever lost my interest. Nice review.